In 2015-2016, a bloom of the red tide alga Karenia brevis and associated fish kills occurred in Northwest and Southwest Florida. Coastal blooms in both areas were first observed in September 2015. Although the Northwest bloom ended in January, the Southwest bloom endured until April 2016. Throughout this period, the bloom location and intensity, and associated local impacts including fish kills and reports of respiratory irritation, varied spatially from Pinellas to Monroe County. The extensive monitoring and response efforts required to track a bloom and its impacts of this spatial and temporal extent involved help from various groups within FWRI and other partners across the state, including an extensive volunteer monitoring network. Two events in particular involved careful coordination of FWRI’s Harmful Algal Bloom (HAB) and Fish and Wildlife Health (FWH) groups. The first event occurred in late February, when extensive fish kills of marine species along the coastline of the Western Everglades were reported, several involving red drum, mullet, mangrove snapper, and snook. This raised concerns that a more extensive bloom of K. brevis, which had been previously observed at “medium” concentrations ranging from 105,500 – 473,000 cells per liter offshore of Pavilion Key (Monroe County), was causing the fish kills. Given the remote location of the reported fish kills, and the need for a rapid response to inform both management and stakeholders, scientists from the FWH and HAB groups designed a response plan utilizing two vessels to simultaneously sample both nearshore and offshore waters in the area impacted by fish kills. Staff obtained water quality data, water samples for phytoplankton, toxin, and eDNA analyses, deceased or moribund fish, seagrass samples, and sediments. Without the cooperation and rapid mobilization of the two groups, and the help of the Everglades National Park, timely samples from such a large area would not have been collected and analyzed. Although the bloom likely had a more northern origin, it is not clear what caused the fish kill. It is possible that a larger-scale bloom advected out of the system and was not detected at the time of sampling. It is also possible that either fish and/or cells may have been entrained or mixed within less saline waters, which can be detrimental to both marine fish and marine phytoplankton. For K. brevis, an influx of fresh water could contribute to cell lysis and subsequent release of intracellular toxins into surrounding water. A second event occurred in early April, when FWC’s Fish Kill Hotline received numerous reports of a fish kill concentrated in Pinellas County, from the southern end of Madeira Beach to Indian Rocks Beach. Once again, FWH and HAB staff investigated. FWH staff conducted a beach survey, and experienced respiratory irritation in certain areas. 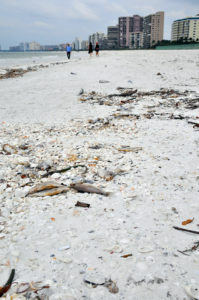 Beachgoers were also impacted and FWH staff were approached several times with questions; they used this as an opportunity to obtain further information about the fish kill. 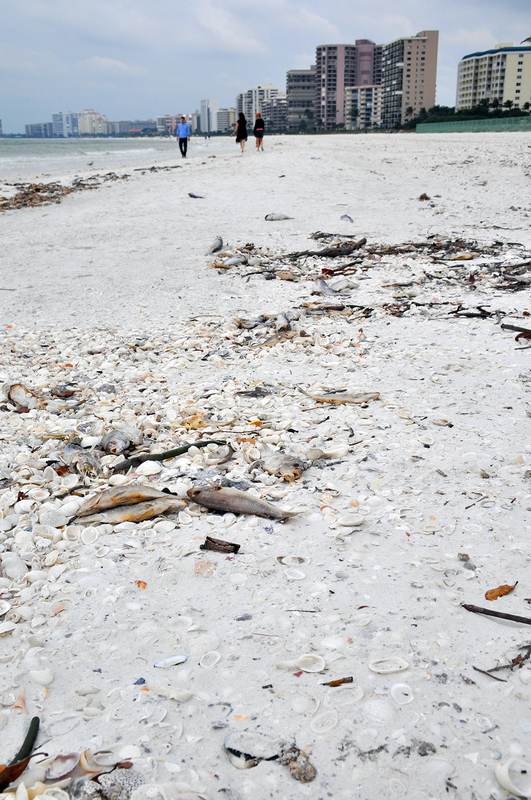 Low densities of a variety of dead fish in early to late stages of decomposition, including hardhead catfish, spadefish, burrfish, toadfish, and grunts, were spread along the shore. Water samples from the shoreline confirmed “high” concentrations of K. brevis, ranging from 1.1 to 1.6 million cells per liter. HAB staff sampled coastal and offshore waters and in the fish kill area and further south, “medium” concentrations of K. brevis occurred in coastal waters. Cells were not observed further offshore. An autonomous glider was subsequently deployed offshore of Pinellas County through FWC and Mote Marine Laboratory’s Cooperative Red Tide program. The glider measures physical and biological parameters at different depths and its sampling track was programmed to facilitate continued surface and subsurface bloom tracking. Again, the collaborative efforts between FWH and HAB staff led to more comprehensive and spatially extensive sampling, and timely dissemination of information to stakeholders, and provided relevant contextual data to inform further response efforts at the time of the events, as well as our understanding of how these specific events occurred to improve monitoring and event response efforts.